This year Swedish syndicalist union the SAC (Sveriges Arbetares Centralorganisation – trans. ‘Central Organisation of the Workers of Sweden’) celebrates its centenary and IWW BIROC were invited to the celebrations as international guests, along with delegates from the Spanish CGT, USI in Italy and SKT in Siberia. Due partly to Sweden’s non-participation in the World Wars, SAC has remained a sizeable union throughout its history and today has between 6000 – 7000 members. Sweden has approx 9m, and union density is extremely high at around 70 - 80%. Rights of negotiation are very strong, as even 2 or 3 people in a workplace are able to declare themselves a union for the purposes of recognition by their employer. The mainstream union confederation is the LO, which is comparable to our TUC but which has a more active coordination role than the TUC does. In the past SAC mainly organised timber workers, miners and construction workers, whilst today the bulk of its members are employed in the public sector or service industries (this pattern is also somewhat reflected in changes in the employment background of IWW members). SAC also runs the Swedish unemployment fund, which illustrates how much a part of society it is. It owns a large office building in Stockholm which houses its own printing press. SAC publish 2 weekly newspapers. As well as stores for stocks of their publicity materials (which are extremely professional looking) and a conference room, the office building also features a board for daily media clippings, and a library of journals from other like-minded organisations around the world. The ground floors of the building are rented out by restaurants and house a subway station. SAC also has a youth section (not part of the union itself), the SUF (Syndikalistika Ungdomsförbundet), which has several hundred members and also publishes its own magazine. The SUF is behind the ingenious and well-organised Planka initiative, part of an international campaign for free public transport (which the Scottish Socialist Party is also affiliated to). Users of the underground train system can pay a monthly subscription and then faredodge. If they are caught Planka will pay their fine out of the pool of money. The substantial remainder of the money in the pool works as a general slush fund for the radical movement. Planka has several thousand members and is going from strength to strength. The 100 Years event took the form of a week of discussions and meetings. I arrived on Thursday 10th June and on this day there was a Forum on International Solidarity. The first speaker spoke about the difference between patronising ‘philanthropy’ and genuine international solidarity between equals. Next a former general secretary of the union, a social worker, explained with a diagram the structural elements of the SAC and the wider Red & Black Co-ordination. Another SAC activist spoke about joint action taken by the SAC and the FAU in Germany. FAU had been organising in a Berlin cinema when the courts ruled that they did not qualify for legal union status. SAC cinema workers wanted to act in solidarity. They targeted action against German films during the Stockholm Film Festival, putting up posters and giving out leaflets, although they did have conflict going on in their own workplace at the same time which made it harder. They tried to get cinema workers across Europe linked up to take action in support of the FAU. FAU were happy as they wanted mass media attention. The local SAC branch in Gothenburg took more action during the Gothenburg Film Festival, distributing more posters and leaflets. The SAC also sent someone to Berlin to meet the FAU face-to-face. The cinema workers were a new section of the SAC, and were happy to be taking action so soon. It inspired them to work more internationally, both through the SAC’s international committee (IK) and directly through their industry channels, and they have kept up the links that they forged in support of the FAU. Next we heard about a bitter dispute in Malmö from 2008. A chef at a sushi restaurant was beaten up by his boss and a blockade by the SAC followed. In Swedish law police were not supposed to interfere in conflicts between workers and their employers... until now. Police dealt with the blockaders brutally, once trying to disperse them with tear gas (sprayed into the face at close range) and batons. 26 blockaders were charged with trying to stop people entering the restaurant. CCTV was used as evidence. In Sweden it is rare that union activists are charged like this. As the courts examined the possibility of totally banning blockades, much international support was received. This solidarity was very important as this was a test case. The IK sought messages of support from overseas. There was more support shown from overseas than from the other Swedish unions. Reformist unions in Chile sent messages of support and the Spanish CGT went to the Swedish embassy. The French were happy to see the SAC being militant and not ‘reformist’ as they had been accused of being in the past! 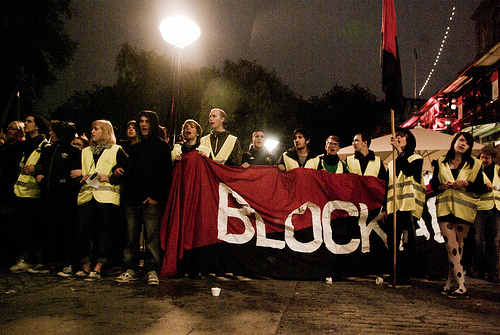 Now, blockades are almost criminalised in Sweden. This was quite controversial even amongst the mainstream unions and the left. It is unusual for the left wing party to say that they support the SAC - so when they do it is appreciated. The Malmö 26 did not appeal, for fear that if the ruling went against them at appeal, blockades could be completely outlawed. As things currently stand there is a legal grey area around blockades. The court case meant lots of media attention and the SAC signed up a lot of new members during this period. They also had many victories against other restaurants after this action, as the restaurant owners knew what they were up against. Next there was a discussion on the present work and future aims of the SAC’s IK, with suggestions from members invited. The IK has been trying to inform SAC members at the base that it can be a good tool for putting pressure on local employers. Many members at the base are not even aware of the existence of the IK. SAC members and international visitors discussed the Red & Black Co-ordination (R&BC). Things have been quieter and less active with regards to the R&BC lately. There is a difference of opinion within the R&BC over how the unions should collaborate. The Spanish CGT, which has 9000 in its transport syndicate alone (the whole union membership is more like 6 times that number), also have broad international co-operation with unions outside the R&BC. All agreed that there was a reluctance to draw energy away from work ‘on the ground’ for international committee work. On Friday 11th June there was another very packed day of discussions. The day was broken into workshops with written questions to get delegates thinking along strategic and critical lines. I also reported about our activities in the BIROC, alongside a delegate from the Spanish CGT. Emil Boss (Systembolaget/Stockholm Local) gave a briefing on the Berns dispute. Berns is a huge Stockholm nightclub and venue, with 2 restaurants. A reformist union has a collective agreement with the restaurants. Swedes are directly employed by Berns and enjoy better rights than insecure migrant workers, who are employed by subcontractors to do most of the dirty work, and do not have rights. There is a clearly defined two-tier workforce. Some of these insecure workers have joined the SAC, and have organised to force their employers to better their terms and conditions. However, both times that this happened, Berns terminated the cleaning contract with the subcontracted company, and signed a deal with a new subcontractor, keeping the same workers on but reversing the progress made regarding their conditions. The team of 20 cleaners were made to work 22 hour days at times, up to 6 or 7 days a week. One cleaner reported how he had to sleep at the workplace between shifts, on a pile of cardboard boxes, then get up and carry on cleaning. They had no right to recourse as they were undocumented, with no official papers to allow them to be working in Sweden. This vulnerability made them especially exploitable. Eventually Berns told the cleaners that some of them would have to be sacked as there was no work. In the past the cleaners had always been moved around between locations to where the work was, so this did not ring true... especially as only the SAC members were to be fired - while, in a gesture of incredible generosity, the non-union members were taken on directly by Berns. The SAC has been targeting Berns with a blockade every weekend since 06/02/10, with at least 50 taking part each time. There have been several opportunities for Berns to end the conflict, but they have chosen to stand their ground and prolong the fight, rather like the current stance of British Airways boss Willie Walsh. The demands of the SAC, which Berns management refuse to negotiate around, range from full reinstatement of the cleaners with a firm that honours good terms and conditions, to paying compensation to the fired workers (without reinstatement). This has now become a personal grudge match for those involved, and a high-profile one, with debates and coverage on radio, TV and in the papers. Other employers in the restaurant industry are financially backing the Berns bosses. The blockade has now cost Berns millions in lost business, with some artists due to perform there cancelling and pulling out, after being contacted by the SAC. The entire complex was forced to close on May 1st. Right-wing politicians from the ‘Moderate Party’ are also piling into the battle, calling the SAC ‘criminals’ and ‘Mafia’ in the media. They argue that it is wrong for the SAC to target Berns instead of the subcontractor. They also claim that the SAC is simply trying to extort money from Berns to bankroll the union. Emil said that the SAC is in fact the union that makes most use of the employment/labour courts in Sweden, but because of the undocumented status of the Berns cleaners, direct action in the form of the blockade is the only tactic that can be used in this dispute. How will the SAC work in 5 / 10 / 50 years? The next workshop asked SAC members to speculate about the future of the union, industry and the country as a whole, and how it might organise in the short medium and very long term. The SAC seemed generally hopeful. They expect to see advances and increased strength in the next 5 years. Recent years development has been rapid rather than steady and they feel that the SAC is a ‘living organisation’. Membership numbers may be decreasing but they feel that activity is growing. Meanwhile the economic situation in Sweden, a wealthy country, is on the downturn. In 10 years time they expect that some older, inactive sections of the SAC may be gone, and that the more active sections should be pushed. Big changes are likely in society and it was recognised that there is a strong extreme right in Europe. FW David O’Connell asked the SAC members about their links with other unions and the SAC’s place in the wider class struggle. They replied that there are difficulties as the SAC is viewed so negatively by the LO. Some members do recognise though that the SAC does not hold a monopoly on syndicalists and so of course there are militant sections within the LO (some are even ex-SAC) that it is wise to keep on good terms with and ideally work alongside where possible. The LO extends across national borders and there is a rumour of a split brewing within the Norwegian LO. Their national conference is now being organised by a maverick branch which is opposed to the Social Democratic party. That night the SAC held another blockade of Berns. It was to be even larger and stronger than usual as the youth section of the Left Party were expected to come and bolster numbers. Emil had briefed all guests about the background to the dispute and delegates from each country had agreed to speak to the Swedish media as ‘international observers’. The IWW was to state that we would be taking up the issue with London & Regional, the UK-based company who owns Berns (and who crucially lack the emotional investment and stubbornness of the Stockholm-based Berns bosses). The comrades from the USI would explain that at home in Italy they are involved with fighting the real Mafia. USI activists were organising a protest against the Mafia killing of a judge who was about to bring in legislation like that in Denmark (which the SAC also want for Sweden), which makes a company responsible for its workers employed through a subcontractor. Finally the CGT delegate would announce that they were the 4th biggest union in Spain and were syndicalists! Blockaders wore hi-vis jackets, gave out leaflets and held flags, placards and banners. There was also a singer for entertainment, and hot food and coffee to sustain blockaders. The police presence was high, and supplemented by ‘Dialog Polis’ who dress in casual clothes, smile, and attempt to engage protestors in friendly conversation to diffuse tension (a very Swedish idea, along with sticking up flyposters with masking tape which everyone, including the SAC, does in Stockholm)! Many clubbers have stopped going to Berns as a result of the bad publicity the blockade causes. This also means that some who do still go there are aware of the cleaners’ dispute and don’t care. Some conspicuously wealthy customers seem to enjoy being antagonistic as they go in. A minority are keen to find out the reason for the blockade and some change their plans and go elsewhere. David told me that after I had gone, a customer threw hot coffee over a blockader. All the police did was to take their details and give them a mild telling off. On Saturday the delegates from Russia arrived and a special meeting was held at SAC House (the union HQ) for all of the international guests. All of the delegates from Russia and Italy were female, which was unexpected. The SKT (Siberian Confederation of Labour) has officially 500 members but not all of those are active, and in addition there are SKT activists who are not actually formally members themselves. The industry in which they have the most members is transport, and the union is also at least half female. Union activists in Russia live an extremely dangerous existence, with even the mildest form of left-wing activity, such as leafleting, or a non-political but mixed-race gig, attracting violent attacks by both police and fascists. Any remaining communists are now pensioners and have convinced themselves that fascism is gone and no longer a threat. There is a real lack of accessible, non-academic class struggle propaganda in Russia, and therefore anti-fascism there consists mainly of physical militancy (essential for mere survival) and no more than that. 2) not politically sectarian – e.g. USI have communists involved. Basically they are ‘libertarian revolutionary’. They want to increase self-organisation beyond the union, across the working class. They are aiming to build networks - for example, an unemployed workers network, a health & safety network, and a precarious workers network - that don’t belong exclusively to the union. The USI delegates told us that Italian workplace law is very advanced and some of the best in Europe. Therefore, while they do make use of direct action tactics like sit-ins and demonstrations, they are also more likely to go to a labour court. Regarding the Red & Black Co-ordination (R&BC), USI said that they had had a preparation meeting a few weeks ago, and were now proposing that the next R&BC meeting be held 11th and 12th September, in North-East Italy. They would like to discuss expanding the R&BC. Suggestions included a multi-lingual website, a multi-lingual newspaper covering stories of struggles in different places, and a symbol for the R&BC. They said it would be good to draw together a basic platform of principles that were not too ideological. Unions and groupings that want to join could apply, and then spend the first year as observers, after which time the existing R&BC members evaluate them for full entry. On Saturday night I was feeling better so stayed until the end of the blockade at 2am. I got to see the double standards of the Swedish police in action, as three blockaders who ‘stood in the wrong place’ were bundled to the floor, dragged off and arrested, in sharp contrast to the light treatment that the clubber who threw hot coffee received the previous night. The blockade was smaller on Saturday but all entrances to the club were partially blocked and many customers were persuaded to go elsewhere. I learnt a lot from my stay in Sweden with the SAC . I have come away with an increased understanding of the benefits and importance of international work, and I hope I have shared that with this write-up. It was also very exciting to see a successful, effective and professional syndicalist union operating on a big scale.